Lasers can be used in dentistry for a variety of dental treatments and procedures. This technology is very precise and offers you a number of other benefits. Our office has been dedicated to using modern technology since Dr. Ted Murray first opened the doors to his dental office. To schedule a consultation with one of our experienced Dubuque dentists, please call Exceptional Dentistry of the Tri-State Region at 563-556-2711. Certain laser dentistry procedures do not require local anesthesia. Bacterial infections are minimized because the laser energy sterilizes as it works. Laser dentistry minimizes bleeding and may speed healing time. Damage to surrounding tissue is minimized since the laser beam is very precise. Procedures performed using soft tissue dental lasers often do not require sutures (stitches). Frenectomy or frenotomy that removes a restrictive frenum attachment. Removal of gum tissue to eliminate a cavity below the gum line. Painless and suture-free removal of benign tumors or soft-tissue enlargements. To reduce pain associated with cold sores and canker sores. A laser frenectomy is a treatment option for babies, children, or adults with a restrictive frenum (also called a frenulum). A frenum is a band of tissue extending under the lip and/or cheek to the gumline, or a band of tissue under the tongue extending to the floor of the mouth. Oftentimes frenum attachments are normal, but a restricted frenum may not function normally and lead to other problems. For both adults and children, a restrictive frenum can lead to gum recession, a large gap between the teeth, or difficulties with eating or speech. In babies, these restrictive frenums are sometimes called lip ties and tongue-ties, and can contribute to difficulties with breastfeeding. One of our dentists, Dr. Kristen Berning, experienced the difficulty herself with breastfeeding her own tongue-tied babies. Please read about her experience in our blog. Dr. Berning provides support for breastfeeding moms who have babies with tongue-ties or lip ties. She uses laser technology to release restrictive frenums, including posterior tongue-ties. To treat gingivitis and periodontal disease, our experienced hygienists use laser dentistry. When your gums get infected, it allows bacteria, plaque and tartar to accumulate in pockets formed between the gums and the teeth. This can lead to chronic bad breath, bleeding gums, infected tissue, bone loss and loose teeth. In advanced cases, gum disease can lead to tooth loss. Laser dentistry dramatically reduces the amount of bacteria and it promotes wound healing. The laser light energy is collected in the mitochondria which "jump starts" the healing process. Laser-assisted periodontal therapy is precise, comfortable, and can be used on nearly every segment of the population regardless of age. Pictured above is an actual case completed in our office where the ultrasonic scaler, hand instruments, and laser treatment were used to treat gingivitis and periodontal disease and return the patient’s gum tissue to optimum health. Notice how the gums were very puffy and swollen in the “Before” photo. In the "After" photo, the gums are pink and healthy. 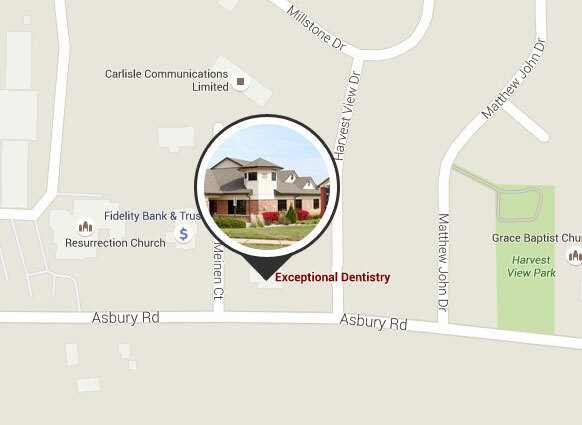 If you are searching for experienced and compassionate Dubuque dentists to provide laser dentistry and other advanced care, please contact Exceptional Dentistry of the Tri-State Region online or by phone at 563-556-2711 to schedule a consultation. "I had the BEST experience in your office. I loved the hygienist, she was so friendly. The office is so clean and nice. I have never had such a great overall experience in any medical office."